Did you know you can catch up on some of your favorite comics titles for free, without leaving your house? 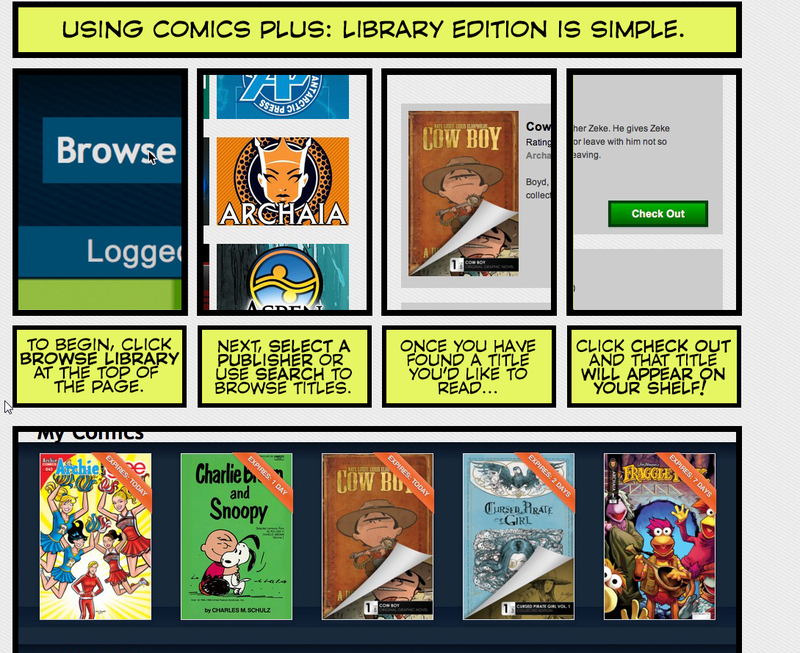 Comics Plus Library Edition brings you single issues from publishers like Archie, Peanuts, Dark Horse, IDW, and more! That means awesome titles like Hellboy, Sarah’s Scribbles, Star Trek, and Adventure Time can be yours for only the click of a button and the presence of a library card number. Comics Plus Library Edition works with your RBDigital account, so if you’ve ever trained with Hoonuit, flipped through RBdigital Magazines (formerly Zinio), played video games with OnePlay, jammed on Qello Concerts, screened a film with IndieFlix, or read or listened to anything on One Click Digital, you’re all ready to go – all of RBdigital’s services can be accessed with the same account. If you don’t have an RBdigital account, getting set up is quick and easy – check out this illustrated guide! If Black Panther has got you itching to dive in to the wide and wonderful world of graphic storytelling, Comics Plus Library Edition is a great place to start! What are you doing on Wednesday? 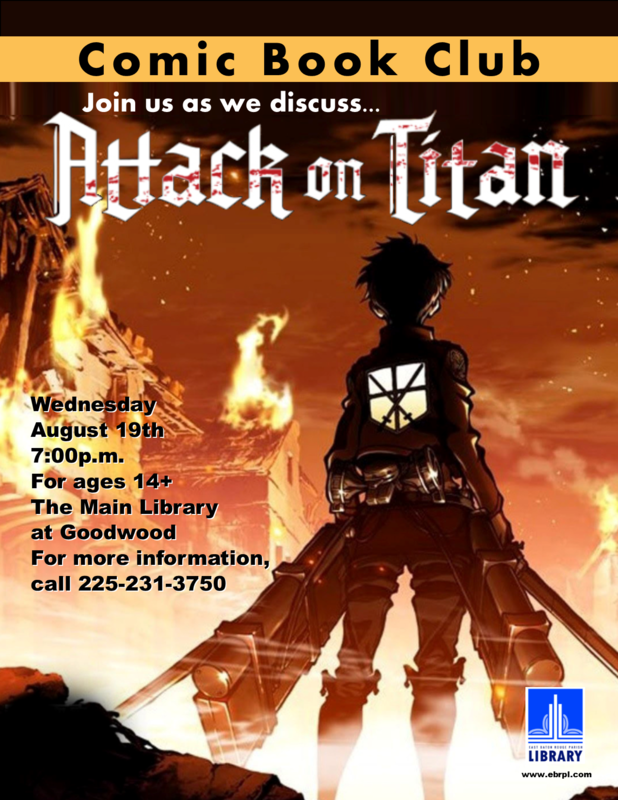 Join us as we discuss volumes 1-5 of Attack on Titan and watch the first few episodes of the anime! Get Ready for Avengers: Age of Ultron with Your Library! If you’re not ready there are so many ways you can prepare with your East Baton Rouge Parish Library. Don’t remember the last Avengers Movie? Or maybe you missed Chris Pratt, a gigantic tree named Groot, and Rocket Raccoon in Guardians of the Galaxy? Your Library has all of the Marvel Cinematic Universe on DVD and Blu-Ray plus a ton of comics based on the movies such as Winter Soldier, Age of Ultron, and so much more. 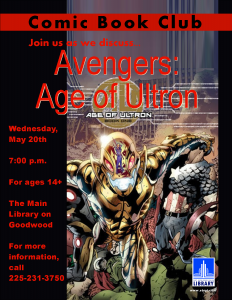 Posted on April 30, 2015 April 30, 2015 Categories EBRPL Blu-ray/DVD, EBRPL Comics, EBRPL CoolLeave a comment on Get Ready for Avengers: Age of Ultron with Your Library! X-Men: Days of Future Past by Chris Claremont and John Byrne. Disclaimer: This review is written by someone who hasn’t read every single X-Men story arc, but has read quite a bit and loved every bit of the X-Men television show from the 1990s. If you haven’t seen the newest installation of the X-Men movie franchise, Days of Future Past, you need to. Pretty much immediately. The film is a true comic book movie and does a phenomenal job of highlighting all of the characters from the highly lauded story line from Chris Claremont and John Byrne. Now that doesn’t mean that you can’t nitpick certain elements from the movie and compare it to the original story or talk about how certain characters were not written like that because you most definitely can do that and that kind of critique can be fun … but, ladies and gents, comics and by proxy comic book movies are supposed to be fun. The only disappointing thing that I came away with this particular collected edition was that it only contains one issue that is relevant to the Days of Future Past story line. Either collected edition is a fantastic read and honestly you could read one or both of them to get the full effect. Regardless, the T.V. show’s theme song is totally stuck in my head. East of West Volume 1 by Jonathan Hickman and Nick Dragotta. Reviewed by Adam St.Pierre. So after two consecutive reads, I think I’m ready to give reviewing this thing a shot. 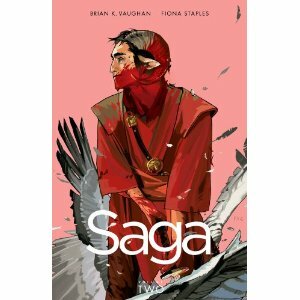 Jonathan Hickman and Nick Dragotta have done something wonderful here mixing serious science fiction, alternate history, and western elements to build a story that could easily garner as much attention as Saga has over the past year or so. The story begins by showing three of the Four Horsemen of the Apocalypse, being reborn/reincarnated as children without Death. Once War, Famine, and Conquest realize that Death is not with them they decide they must find and kill him, immediately setting up the conflict that carries throughout the rest of the story arc. 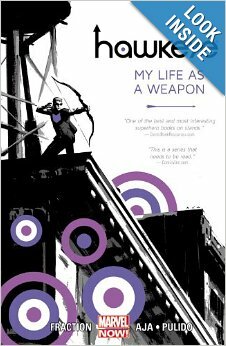 After the reincarnation scene, Hickman and Dragotta piece together what happened from the Civil War to 2066, and how we form the Seven Nations of America. Our protagonist, a Clint Eastwood-like Death dressed entirely in white, is finally shown exacting his brand of bloody vengeance upon all who have wronged him. What exactly occurred between the Horsemen and a myriad of other questions are introduced very quickly to the reader which can make the story a bit difficult to keep up with at first. The payoff is definitely worth it and the end of the trade seriously leaves you wanting for more. Check out Volume 2 soon! 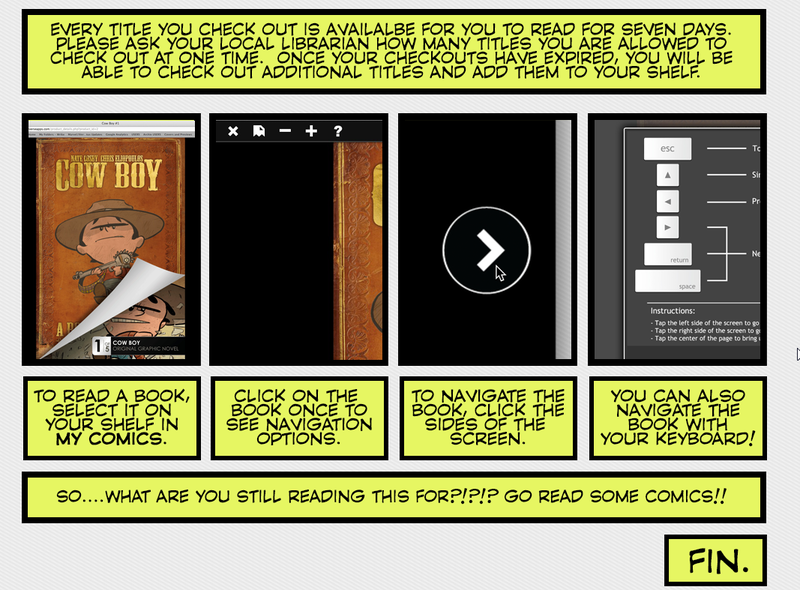 We’re excited to introduce a great new comic book resource, Comics Plus. It’s really easy to use: create an account and then click on “Browse Library” at the top of the page. You can browse titles by your favorite publisher (everything from Archie to BOOM! to Red 5), age range, or by using the search bar to type in a title. Simply click “Check out” by the title you’d like to read and it will appear on your shelf! Titles check out for seven days and you can check out up to five comics per week. There’s no software to install and titles are automatically returned. Take a look at the Comics Plus InfoGuide to find out more. 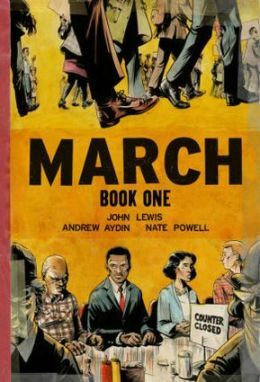 According to the experts at Comic Book Resources, Goodreads, Publishers Weekly, and a few others we’ve compiled a list of the best Comics and Graphic Novels of 2013. What are your favorite Comics and Graphic Novels of 2013? Check your local library branch or our Comics and Graphic Novels infoGuide for New comics.